Remember Dolly the sheep, the first mammal born as a product of cloning? That was in 1996. A few years after that the rhesus macaque, Tetra, was created by a simpler technique called ‘embryo splitting’. Over the last decade, the exponential growth of technology in areas of bioengineering and medicine has led researchers to revisit the idea of developing cloned mammals for the purpose of research and therapy. 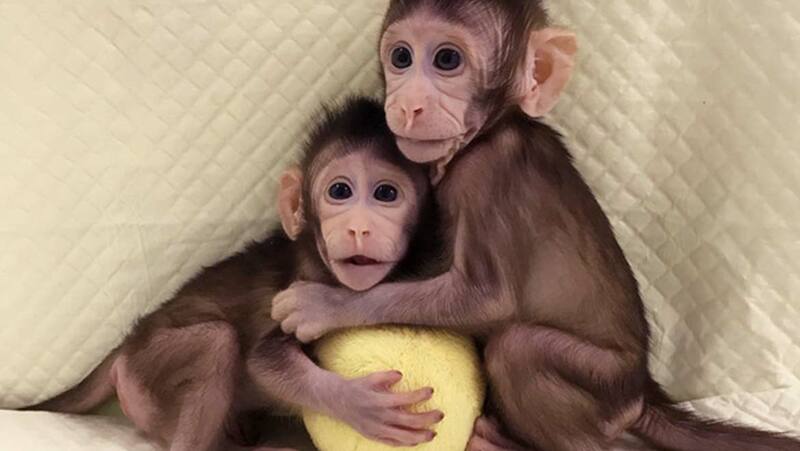 Using the same reproductive cloning technique — somatic cell nuclear transfer (SCNT) — that produced the famous sheep, Dolly, scientists at the Chinese Academy of Sciences Institute of Neuroscience have developed Zhong Zhong and Hua Hua, a pair of long-tailed macaques. Born a few weeks apart, these monkeys are the world’s first primates to be created by this complex method. The animals are currently stable (and up to usual monkey activity), and researchers predict that more of them will be born in the near future. Their work has been described by Liu, Z. et al., in the Cell journal. What is SCNT? Somatic cell nuclear transfer is when the nuclei of body or somatic cells, including its DNA, are transferred into enucleated eggs, in vitro, to grow a viable embryo. Similarly, the researchers cloned the monkeys by taking DNA of fetal monkey cells and incorporating it into female monkey cells that did not have any genetic material. Following this, the embryos were zapped with an electric current (to trick it into thinking it has been fertilized) and set into the womb of surrogate monkeys. Et voila! The babies, carbon copies of their mother, were born! In the paper, the team described that, using this technique, they obtained 79 well-formed embryos which were implanted into 21 surrogates. This led to six pregnancies, and finally the birth of two monkeys. To improve chances of survival, the researchers included certain growth factors and nutrients, messenger RNA and trichostatin A to be specific, which allowed the embryos to mature well before embedding it into the uteruses. Biologist at Columbia University, Dieter Egli, also indicated his enthusiasm by suggesting the role of cloned mammals in the potential treatment of human diseases in the future. In an interview, he also mentioned that the group did not have any intention of applying this to humans, and it was done only for the betterment of mankind and human health. Reiterating the above, London-based embryologist, Robin Lovell-Bridge, talked about the cloning method and said: “It remains a very inefficient and hazardous procedure. The work in this paper is not a stepping-stone to establishing methods for obtaining live born human clones. This clearly remains a very foolish thing to attempt.” The group of Shanghai scientists have claimed to follow the US National Institutes of Health guidelines for animal research while conducting all experiments. Whether this will ultimately lead to human cloning or not, for the moment, it is hard not to marvel at technology and its results — fully functional living beings created from mere cells in the lab.